If you want fantastic outdoor scenery then the Isle of Skye has it all in abundance. The Storr situated on the Trotternish area of the island and is the largest landslip in Britain. 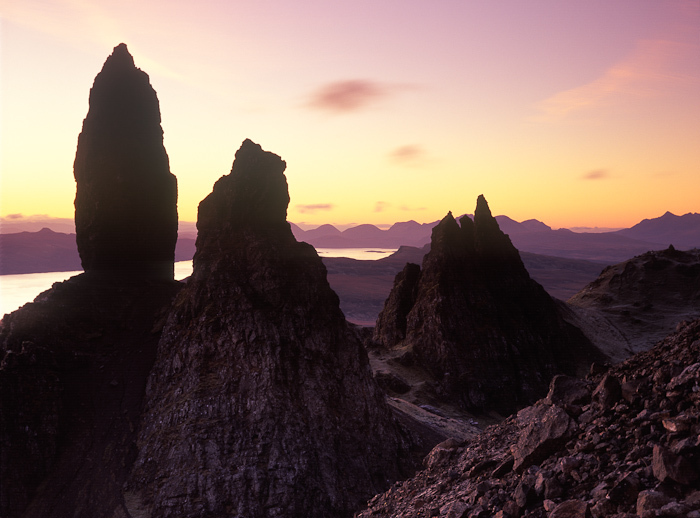 It is home to a number of strangely shaped pinnacles, the most famous being the 50m high Old Man of Storr. Having hurriedly climbed the hill to capture the dawn, I composed the shot to convey the lunar like landscape. The distant Cuillins seemed to echo the shapes of their smaller cousins. If you would like to see how the scene is transformed after a few minutes, click here. Photo © copyright by Graham Chalmers.